Shares in HSBC have fallen after the bank reported a steeper-than-expected fall in annual profits. It reported a $7.1bn (£5.7bn) pre-tax profit for 2016, down 62% on the $18.9bn reported a year earlier. 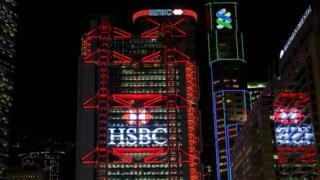 HSBC attributed the fall to a string of one-off charges, including the sale of its operations in Brazil. HSBC said its performance had been "broadly satisfactory" given "volatile financial conditions" but warned a rise in global protectionism was a concern. The bank also announced a smaller-than-expected share buyback. That also helped undermine shares, which were down by more than 6% in London. "It's a bank that is still in transition after the crisis," said banking analyst Chris Wheeler from Atlantic Equities. However, he thinks this could be the last set of results that include big one-off charges, for reorganising the business and writing-down the value of assets. Alluding to the US election and the UK's vote to leave the European Union, HSBC said 2016 would "be long remembered for its significant and largely unexpected economic and political events". "These foreshadowed changes to the established geopolitical and economic relationships that have defined interactions within developed economies and between them and the rest of the world," said chairman Douglas Flint. "The uncertainties created by such changes temporarily influenced investment activity and contributed to volatile financial market conditions." Looking ahead to 2017, the bank said the "outcome of the US election has added to concerns about a rise in protectionism". "This has been accentuated in many parts of the world by technological change and income inequality." HSBC said that any "amplification of this trend" would lead to a disruption in global trade and affect its traditional line of business. Investors had been expecting a share buyback worth between $2.5bn and $3bn, so were disappointed when HSBC announced a plan to buy back $1bn worth of shares, said Mike Amey, from the giant fund management firm, Pimco. Investors like share buybacks as they typically boost a company's share price. However, Mr Amey added that Tuesday's decline in HSBC shares should be put in the context of a 50% rise in their value over the past 12 months. Analysts also have worries about the underlying performance of HSBC. Ian Gordon from Investec said the results for the fourth quarter confirmed the "very grim reality" of falling profit margins. Those falling margins reflect years of very low interest rates and HSBC's move into less risky areas of business. Mr Gordon said the pressure on profit margins would continue in 2017 and HSBC would attempt to offset that with continued cost cuts. HSBC has been on a cost-cutting drive since 2015, with plans to cut 8,000 jobs in the UK and achieve $5bn in savings. Earlier this year it revealed plans to shut a further 62 UK bank branches in 2017, as more customers conducted their transactions online. The bank closed 223 UK branches last year. Group chief executive Stuart Gulliver said the bank was investing more than $2bn in "digital transformation initiatives to improve our offer to customers". HSBC makes most of its money outside the UK, with Asia accounting for the bulk of its global pre-tax profits. The bank confirmed last year it would keep its European headquarters in London, despite the Brexit vote. But announcing the results on Tuesday, Mr Flint said the bank's current planning suggested it may need to relocate some 1,000 roles from London to Paris over the next two years, depending on how negotiations develop. He added the bank had "broadly all the licences and infrastructure needed to continue to support our clients once the UK leaves the EU".